Cal here, the third of the “three dolphins” contributing to Tuesday Stretch. I hope everyone is enjoying the stretch glass info and photos we are sharing. 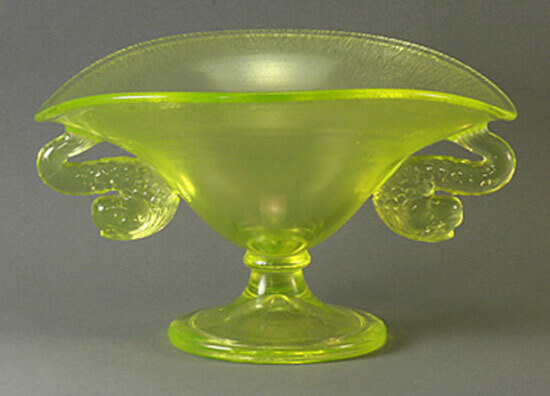 Like Carnival glass (and EAPG, Flint Glass, Victorian Glass, Cut Glass, and many other collectibles) there is so much to share and learn about stretch glass. We are seeing some wonderful stretch glass from you here on the discussion board. Thanks for sharing; we look forward to discovering more stretch glass from your contributions. I’ll mention again that we are celebrating the 100th anniversary of the beginning of “mass” production of stretch glass in 1916. There is a traveling exhibit of approximately 100 examples of stretch glass which is making its way around the US as Bob & Helen Jones set it up at Depression Glass shows. If you are interested in seeing if it is coming to your city, check www.stretchglasssociety.org for the exhibition schedule. Our members will also have exhibits of stretch glass at the So. California Carnival Glass Show and HOACGA. There are several museums which also have exhibits of stretch glass – so if you are interested in seeing more stretch glass, it is out there to be seen. I’m going to highlight Fenton dolphins tonight. Dolphins (iridized or not) are one of my favorite glass ‘characters.’ They have been around in glass for centuries. I understand they are considered to be good luck for sailors. I’m not a nautical sailor, but I am “sailing” through life and hopefully my dolphins are watching over me. When Frank’s Closet at Fenton was cleared out a few years ago, there were several Boston & Sandwich dolphin candleholders found. I think it is reasonable to conclude that they had some influence on the Fenton dolphin design. At Boston & Sandwich the dolphin was typically part of the pedestal of a comport or epergne or the “stick” of the candleholder. 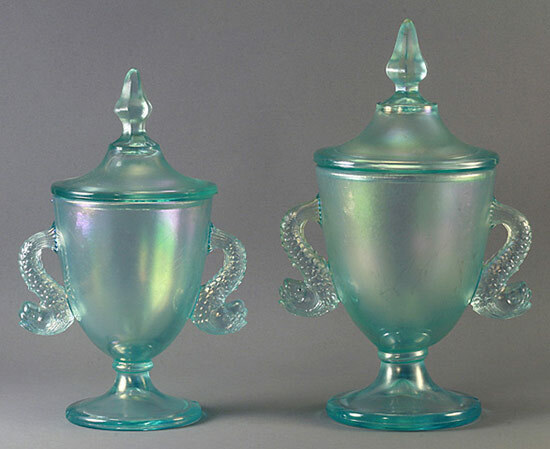 Fenton incorporated dolphins into their glass in a completely different way; they reduced the size of the dolphins and primarily incorporated them into the sides of bowls and comports, similar to handles. (Don’t under any circumstances, pick up these pieces by the dolphins, btw.) 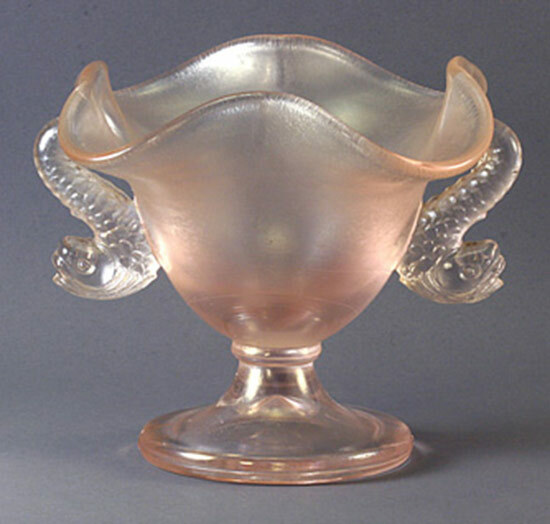 There is one small Fenton comport which used the dolphin as the pedestal – this is one of the more challenging dolphin forms to find, so if you see one at a reasonable price, you may want to pick it up. 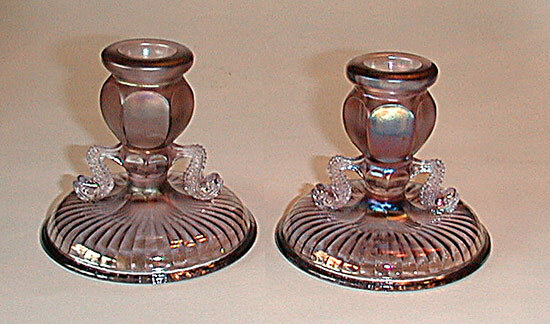 And there are short dolphin candleholders – also not easy to find. Tonight I’ll just touch on the colors in which we find dolphin stretch glass. The shapes and sizes are a topic for another night. As with much stretch glass, color makes all the difference in terms of rarity. Velva Rose, Aquamarine and Florentine Green are by far the most available colors for dolphin stretch glass. Somewhat less available, but still found relatively often, are the Topaz and Tangerine dolphin pieces. 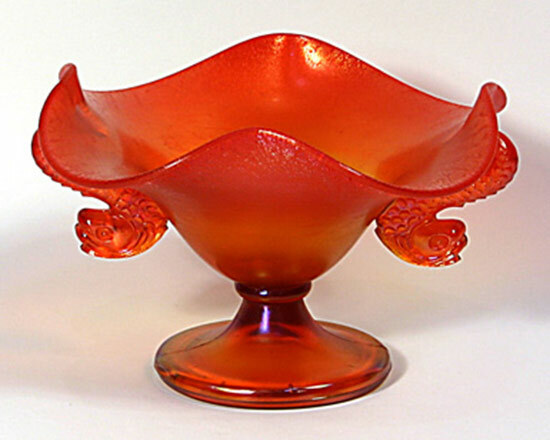 (Tangerine dolphin fan vases and comports are NOT rare as eBay sellers often say in their ads.) Wistaria dolphins are somewhat more difficult to find and Ruby (Red), Celeste Blue and Amber examples are very hard to find generally commanding premium prices. Certain forms in certain colors are more or less available, so every piece in Aquamarine is not common, for example. Fenton catalogs advertise a line of Persian Pearl dolphins. Today we see very few of these. The ones we do find generally have a bit of a pink tint in the glass but the dolphins are crystal (clear) glass. This has caused a debate as to whether these are very light Velva Rose or Persian Pearl stretch glass. Since we are not aware of anyone who made these vintage dolphins being alive and available for consultation, this is a mystery which may remain unsolved forever. When I find a dolphin piece with crystal or clear dolphins, even if the rest of the glass is not “frosty” Persian Pearl, I generally buy it. For most folks, I think these pieces fall into the “so what?” category, the Velva Rose is too light and they are not white and frosty enough for those who like Persian Pearl stretch glass, so they do not necessarily get much attention nor command premium prices. 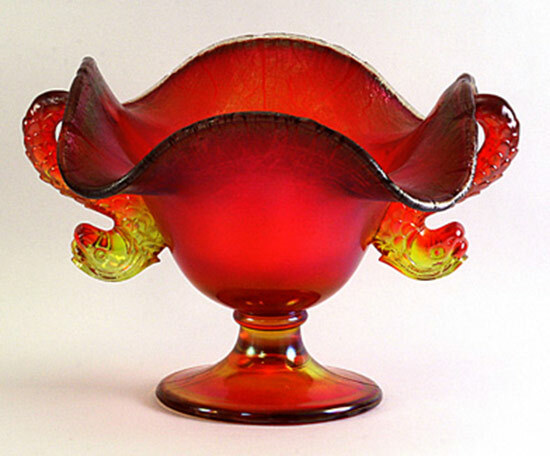 In 1994, Fenton made Ruby twin dolphin fan vases for the Stretch Glass Society. Most of these are clearly marked on the base and “signed” by Frank and the bases of the new pieces are actually thinner than the originals! In subsequent years, Fenton made a number of iridized dolphin pieces in a variety of colors. Most of the contemporary dolphin pieces are marked with one of the Fenton logos. Again, these are a topic for another night. I’ve tried to include examples of each color in which vintage dolphin stretch glass was made and of which I am aware. There are many shapes – many more than are pictured here. I’ll share examples of some of the other shapes later. In the meantime, I look forward to seeing the dolphins in your collections.